Regular practice of massaging entire face and body using Ayurveda oils is a great way to unlock your body’s healing ability, revitalising and rejuventating your body and mind which contributes to a healthy body and mind. We all have busy time schedules with ‘lack of sleep’ in our day-to-day life and many of us suffer from high levels of stress and work pressure in our busy lives. Let me tell you, these stress have a negative impact on our overall mental and physical health.Massage with Ayurvedic oils can relieve mind and body from unwanted life stresses and toxic build ups. Toxins are dislodged from the bodily tissues and gently eliminated, leaving our entire system deeply balanced and nourished. 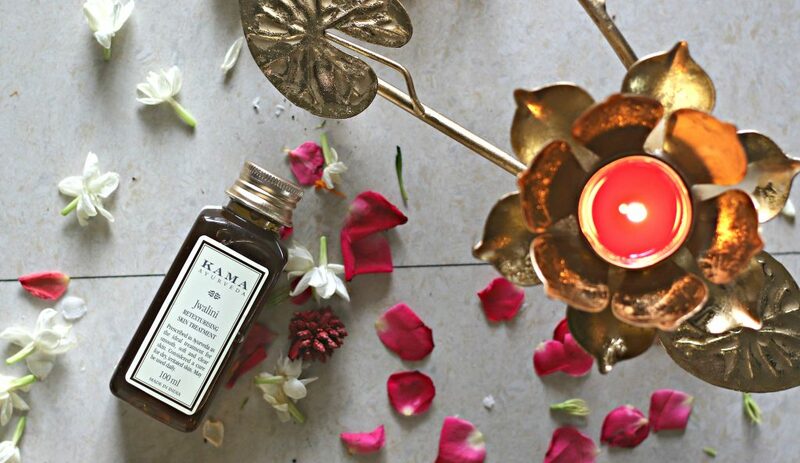 I have come across this Indian brand, Kama Ayurveda which has a variety of Ayurvedic Massage oils. I am starting a new series on my blog. A #MassageOilSeries section on my blog where I discuss in detail about some of the massage oils that I totally love and which are Made In India. 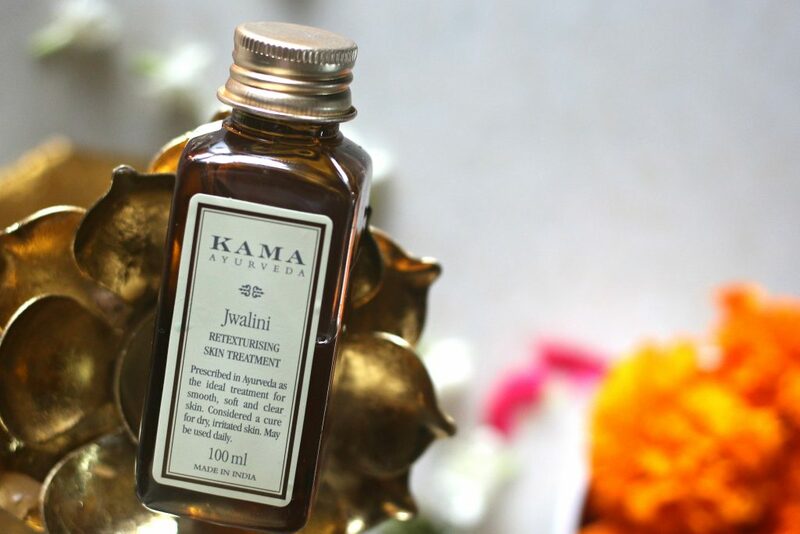 Jwalini Oil is a classic ayurvedic treatment for face and body that re-texturises dry, irritated and sun damaged skin. Product Claims – Prescribed in ayurveda as a treatment for smooth, soft and clear skin, this oil treatment is formulated from natural herbs processed in pure coconut milk and sesame oil.Helps clear up skin irritation and itching. It is an excellent after-sun remedy for sunburn, tanned or hyper-pigmentation. Contains costus and cardamom which are known for their ‘varneekarana’ properties – the ability to enhance skin texture and treat irritation. Regular use results in healthier, softer skin that is visibly smoother and radiant. What is Jwalini Oil made of – Is it Natural ? Coconut oil – Rich in Lauric Acid, Organic Coconut Oil provides immunity against bacterial, fungal and viral infections. Rich in Vitamin E, it keeps the skin moisturised and healthy. Organic Coconut oil is rich in nutrients that soften, relieve dryness, removes dead skin and has natural antioxidants properties. Coconut oil makes a very effective conditioning treatment. It soothes dry sensitive skin or scalp and adds lustre to damaged hair. Elettaria Cardamomum – also known as Green Cardamom, is pungent and aromatic in nature. It possesses dermatological and anti-microbial qualities. It soothes inflammatory symptoms in the skin. Coconut milk – is packed with vitamins C, E, B1, B3, B5, and B6 as well as iron, selenium, sodium, calcium, magnesium and phosphorus. Coconut milk contains all essential nutrients required for healthy hair, boosting your hair follicles and promoting hair growth. It has high levels of Vitamin C which helps maintain elasticity and flexibility of skin. Also rich in nourishment, it prevents wrinkles, sagging skin and age spots.The natural fatty acids in Coconut milk help treat dry and irritated skin and remove harmful bacteria. Cinnamon – It possesses aromatic properties and majorly helps in restoring the natural color of the skin. it is also an excellent toner, as it naturally suspends excess oil from the skin or scalp. Indian Frankincense – a rich ingredient of ancient times,Indian Frankincense actions wound healing, female hormonal issues, arthritis, and air purification.also known as dhoop ,burning it in the house is said to bring good health.this ingredient also has a powerful role in preventing and treating skin cancer. A good list of skin loving ingredients, isn’t it ? 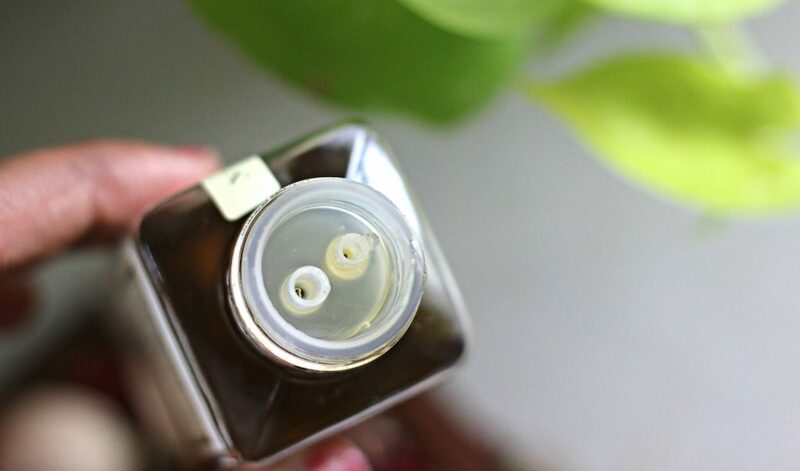 Well, What attracted me the most to buy this oil is – It can be used on face as well as body. And, I have never come across any oil that claims to get rid of sun tan. One of my major body concern is unwanted spots and left over marks of ingrown hairs as well as after a minor accident 3 months back, my body was left with a little scarring. On my upper leg and right arm and wrist. I decided to try if this oil help remove the scars. 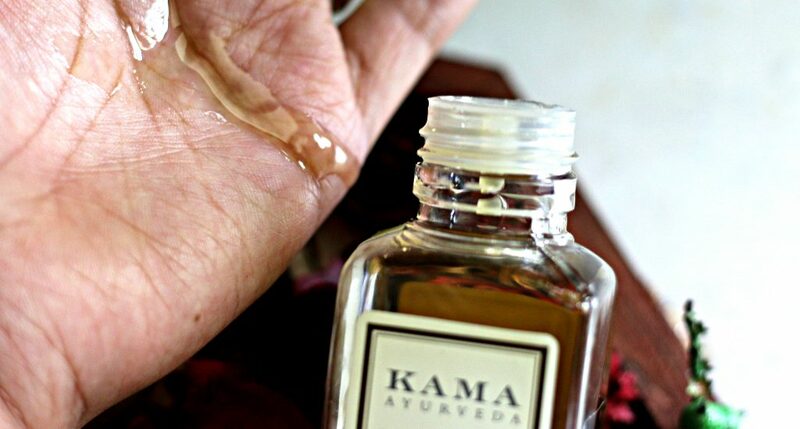 I will talk about Nalpamaradi from Kama Ayurveda that I totally love to use along with this in a different post. Jwalini is a classic Ayurvedic treatment that retexturizes dry, irritated and sun damaged skin. 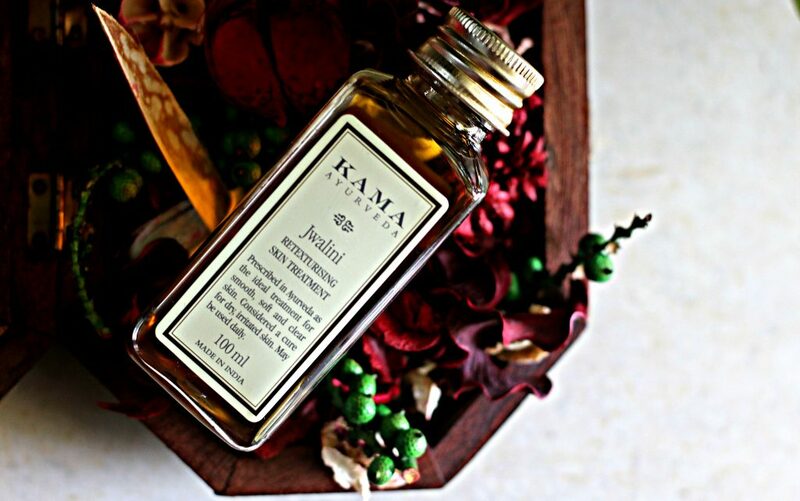 While Kama Ayurveda’s Nalpamaradi thailam is a powerful skin detanning treatment. The moment you open the bottle – First thing that you notice is this stopper which helps prevent spillage. There is a cap for the stopper. It’s not in the pictures. I purchased this from Nykaa. I paid INR 350 (Around £5.00 ) for 100 ml. Right now, they have increased the price of this oil. It’s INR 495 (£6.00) now. I love the herbal fragrance of this. Now, coming on to how I use this oil – I take the required amount onto palms and massage it gently into my face and body until it’s well-absorbed. While massaging, you feel the oil warming up a little bit. I usually leave it on for about an hour and wash off with a mild cleanser or a ayurvedic soap like Ashtapathy Olive Soap. Even though the company claim that it can be used for face and body – If you have a acne prone / sensitive skin like me – You might have to do a patch test before applying it on your face. I don’t recommend you use this on your face if you have active acne or acne-prone skin or if you are allergic to any of the ingredient it’s made of. If you have pigmentation problems like dark under arms, dark thighs or uneven body area etc – You can use Jwalini retexturizing skin treatment oil along with Nalpamaradi thailam. Massaging is the key. You can use this oil daily depending on our skin concerns and let the oil sit on the face or body for about 45 minutes to an hour and you may wash off using a mild cleanser/natural soap. It is an excellent after-sun remedy that treats tan and hyper pigmentation. Now, when I say it treats sun tan, don’t think that it’s a alternative for sunscreen. You cannot apply this oil and then go out in sun. This oil nourishes the body and enhance the skin tone. By enhancing, I meant, the spots and pigmentation gets reduced, marks on body area reduce to a great extent and lightening of new minor surgery scar removals. I can see a difference myself. My arm scar is a lot better and my in grown hair marks etc are faded too. It has a shelf life of 2 years once opened. The best time to apply this oil is at the end of the day before you take a shower. Do a mini massage before your shower and bed or simply massage the soles of your feet with this oil. The calming aroma certainly help people with insomnia and promote peaceful sleep. After massaging about 20 minutes, allow another 20 minutes for absorption before a warm bath or shower. It’s a ideal treatment for smooth, soft and clear skin and also a cure for dry and flaky skin too. In one of the upcoming post, I will discuss about how I use Nalpamaradi Thailam as well. To decide which treatment oil to buy – I suggest, understand what’s your body/skin concern. If it’s majority of hyper pigmentation or uneven skintone – i would suggest you buy Nalpamaradi. If you suffer from dry skin, minor scars, blemishes, dehydrated skin etc and if you don’t have any active acne on skin – get Jwalini. • 100% Natural (skin loving ingredeints) ; Store in a cool dry place. Instead of taking the bottle to the shower. Make sure to dispense the required quantity in a small bowl and use it. • Good remedy for hyper pigmentation. Stretch marks as a result of gym get reduced to a great extent. 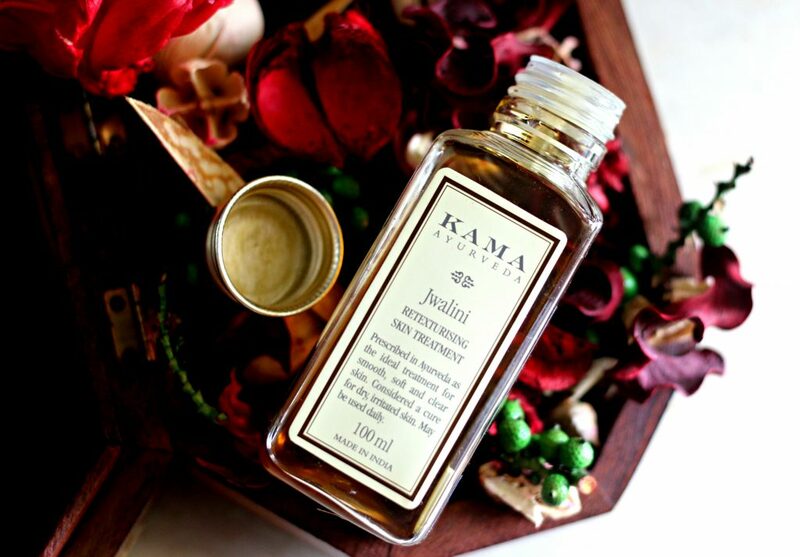 Availability – Kama Ayurveda Products are available in their official site here. They ship internationally. 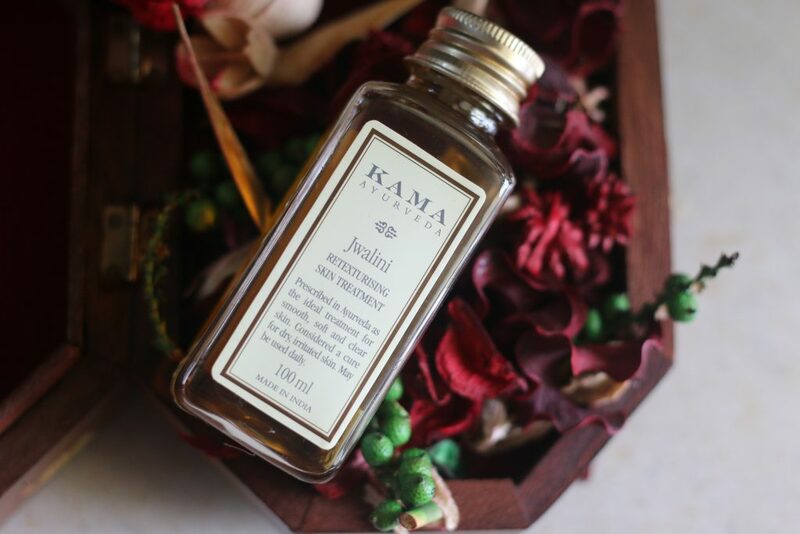 Have you used Kama Ayurveda Jwalini Retexturising Skin Treatment Oil ? Such a detailed review, I bought this oil last time I went to India and loved it. Thank you for reminding me to rebuy this one. Preet, thank you so much for visiting… I love this oil… I will sure, repurchase this one…. You review got me hooked..I am going to try the sample and then proceed buying a full size too..this has got great reviews everywhere! Do try it girl….Me my mom, my cousins.everyone loves it.. I have quite a few in grown scars on my leg. Maybe this oil could help me reduce the pigmentation. Hi Sangeeta …I was missing you around…hope you are doing great…Yes, for spots on leg, this works great….For my in grown scars – I also do a easy hack – I purchased wild turmeric powder from Amazon, I m mixing it with forest honey and applying it every week thrice…only on spots…It fades the scar quickly..do try it..
Love your detailed articles.. Very informative Renji.. 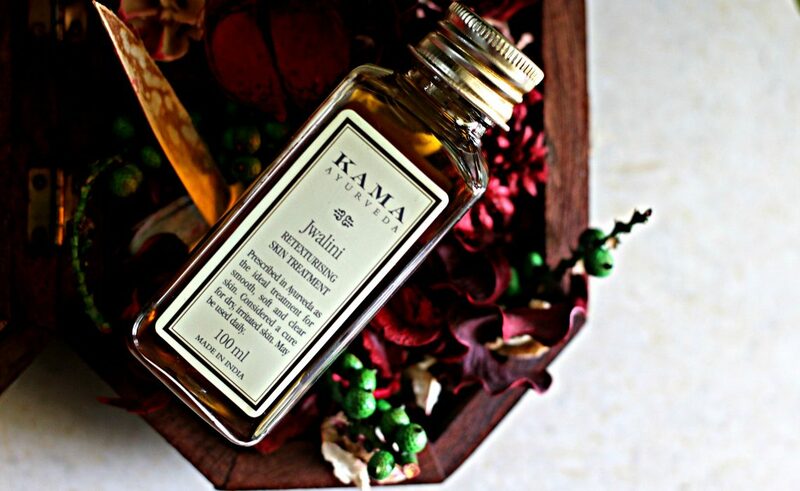 I am loving Kama Ayurveda products these days.. Would like to give this a try as well.. I love this brand and beautiful click dear. Great review. This sounds awesome and divine. 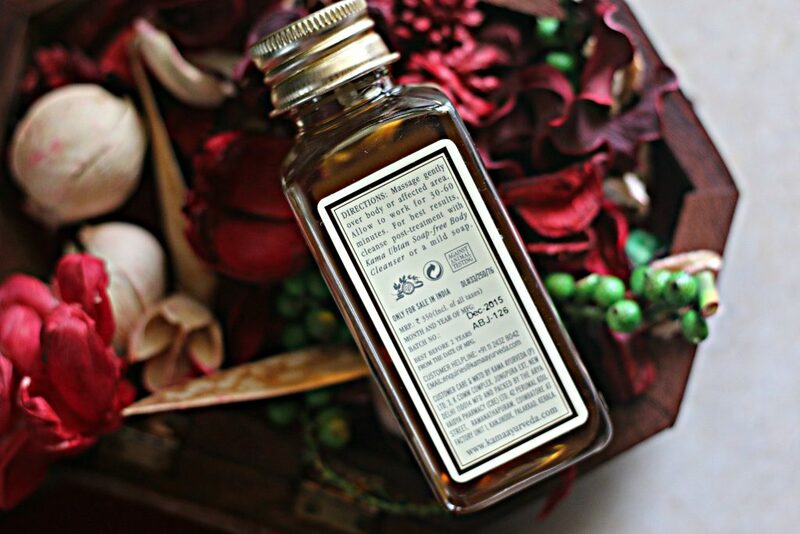 I love the sound of this massage oil series, and I love the photography in this post! Ayurvedic treatments need a lot of patience – and I feel that it gives the best results. Thanks for sharing the website – I ll try it out. Oh wow! This sounds amazing! The ingredients list has some interesting combinations there. I’ve been using oils as an after suncare for years now. I find that my skin heals from any over exposure or strong uv damage a lot quicker. Thnx. A very detailed review. Tempted me to buy it. Will share my exerience too. Wanted to ask that can we use it on face n body as night cream?